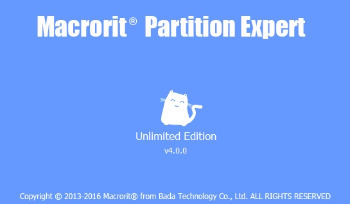 With the enhanced disk partitioning technology, Macrorit® Disk Partition Expert came out. As the latest partition magic pro alternative software, it provides powerful features that enable users to extend system partition, resize move partitions, create, format, delete partition, besides these, it also possesses the unique data protection technology and best data moving algorithm, which means it guarantee the 100% data safety and the fastest data partition moving speed. Everybody wants to accomplish the related disk partition operations with zero-risk and wishes all these can be done in a fast speed; luckily, Macrorit® Disk Partition Expert hereby is the right choice for small business who are running Windows 7/8/XP/Vista/2000 Professional both 32 and 64 bit. – New! 1 second to extend NTFS partition for Windows Vista and later OSs. – New! Extend system partition without REBOOT for Windows Vista and later OSs. – New! Align partition: improve the speed of disk on reading and writing data, especially for SSD. – New! Upgraded to the famous Windows 8 / Office 2013 user interface. – New!Added portable edition for windows. – New! Added Core.api. Bugs fixed in previous version: including 0x00004642 error code; ERR_EXTEND_VOLUME, etc. – Convert MBR to GPT disk without data losing. – Wipe free space/unallocated space. – Shorten the loading time, added splash. – Convert Primary partition to Logical without data loss and vice versa. – Support to resize FAT partition and change cluster size. – Support to resize FAT32 partition up to 2TB. – Support to format large drive in FAT32 partition up to 2TB. – Convert NTFS to FAT32 – Easy Approach to Converting NTFS to FAT32 Partition. – Extend system partition – Solve your OS low disk space problem and keep it running normally. – Resize & Move partition – Change partition size and location as you wish at a fairly fast speed. – Super-Fast Disk Defragmentation – Smart defrag works while processing related disk partition operations. – Create/delete/format partition(s); wipe unallocated space, partition or whole disk. – Partition surface test & Check hard disk; copy partition, migrate OS to a new hard drive. – Support disk larger than 2TB, full support 512Byte/1K/2K/4K sector size. – Works on Windows 10/7/8/ both 32 & 64 bit. – Guaranteed data safety: Power-off data protection and data disaster tolerance. – Maximum hard drive performance & disk stability. – Experience the unexpected super-fast resizing and moving partition speed. – All-in-one partition software provides you powerful and completely features.